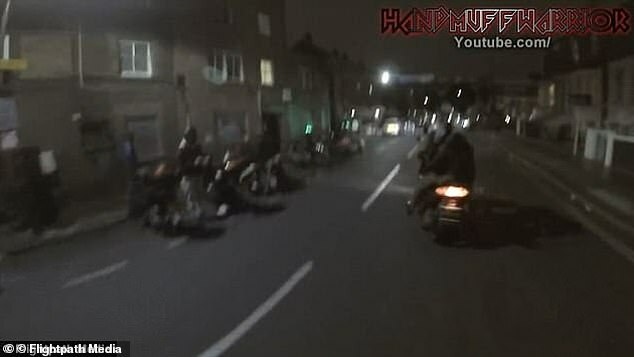 Vigilante couriers are taking to the streets of London to fight back against moped crime. Biker Biker is a volunteer group for riders across the capital who want to reclaim the city from moped thieves. 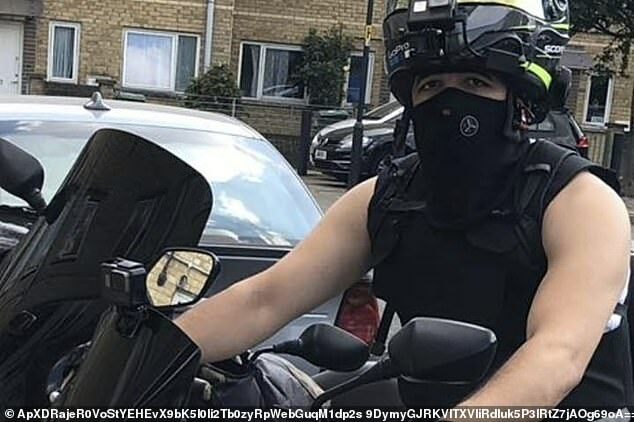 Members don stab vests and wear helmet cameras when they go out to protect themselves while they capture footage of crimes taking place on bikes. Several intervene at great personal risk, including Omar Marjan, who has been targeted at least three times and was stabbed in the hand while delivering parcels. The 23-year-old managed to throw two men ‘armed with hammers’ off him when they cornered him as he finished his shift in west London in May. Mr Marjan single-handedly fought off his attackers in Shepherds Bush, claiming he was ready for them after two previous assaults. Another clip uploaded to YouTube shows the courier chase a young moped rider after allegedly knocking over a pizza delivery driver. He told Metro: ‘I mentally went out every time on my bike as if I was going to war. ‘As I kept recording what was going on my following was going up and up. It got to the point where I was like ‘there’s a lot of them I need back up’. 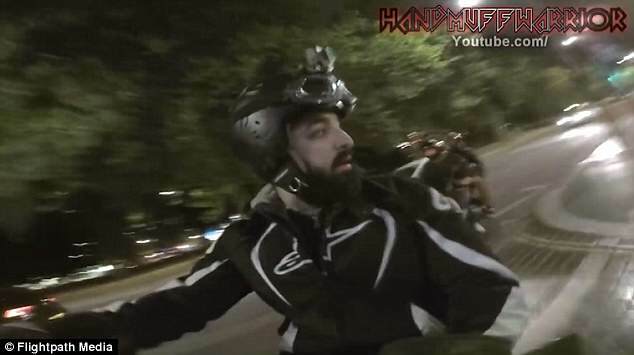 After starting his own YouTube channel ‘HandMuffWarrior’ a year ago, he decided to join up with Biker Biker to make more of an impact. The collective also use Facebook and Instagram to track down thieves selling stolen bikes online. Using fake accounts they trick them into a meet-up and surprise them with a gang of people to claim back the bike. 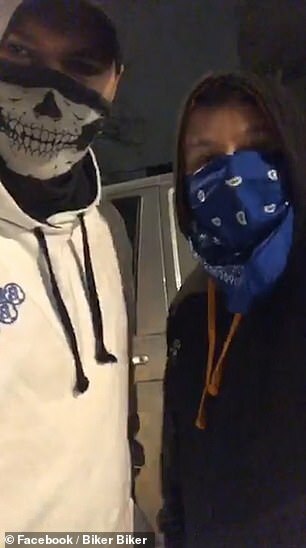 One Biker Biker video shows a masked vigilante driving to return a bike he retrieved after the thief who took it tried to sell it on the web. When he meets the owner he explains what the volunteer group does across the country and the pair get a picture together to celebrate. 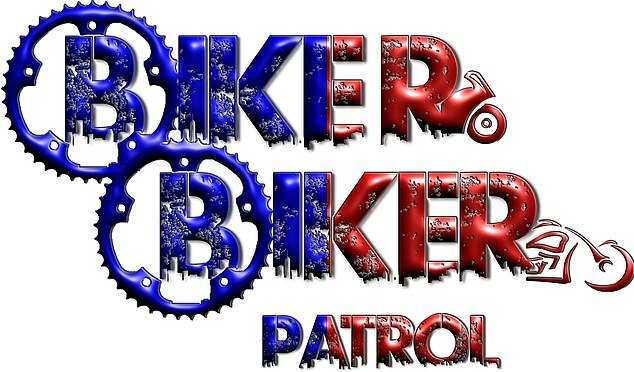 Biker Biker also shares posts concerning lost or stolen bikes on their social media channels. Mr Marjan claims when group members retrieve a stolen bike they ring the police to get ‘permission’ to remove it with a recovery truck. The Metropolitan Police say there has been a 36 per cent reduction in moped crime since officers were given the power to ‘ram’ thieves last year. But figures show moped-related offences have gone up from 827 in 2012 to a staggering 23,000 in 2017. The Met says its so-called ‘scorpion’ drivers only use the tactic as a last resort to stop muggers who are a risk to pedestrians or putting police in danger. 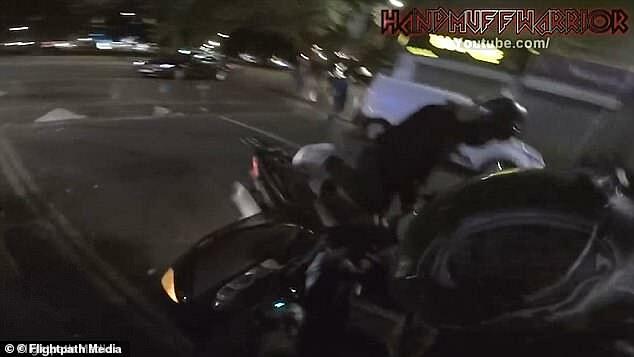 The force released footage of scorpion drivers on the job in November, leaving Londoners stunned at their new powers to knock suspects off their bikes. 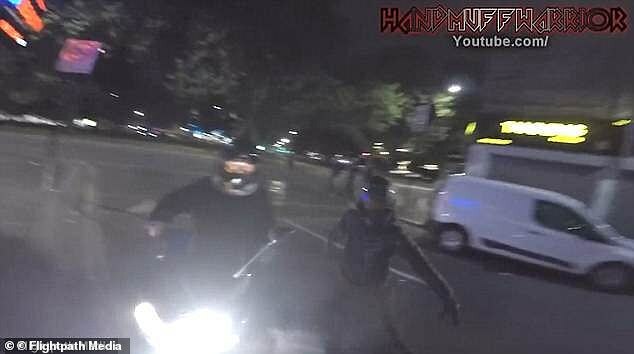 Last week a dramatic video was posted online of moped thieves forced to flee a London estate after furious residents caught them trying to steal a bike. Neighbours launched missiles at them from the heights of their tower block in Thamesmead, south east London. Police were called at 9pm last Thursday but the thieves had already escapes. There have been no arrests. Last year the Metropolitan Police were given powers to ‘ram’ moped riders using them to carry out crime. So-called ‘Scorpion’ drivers are permitted to use force against moped thieves where appropriate. Police say guidance on the use of vehicles in stopping mopeds is similar to that surrounding the use of force by officers on foot. Officers are told they can only use force when it is ‘absolutely necessary, reasonable and proportionate’. Police car drivers have to keep this in mind when deciding whether to crash into a fleeing moped mugger. Whereas police may have been more reluctant to chase robbers without helmets in previous years, the spike in moped crime has concentrated the minds of Scotland Yard chiefs. More training for ‘Scorpion’ drivers and the increasingly dangerous tactics used by muggers has led to the method being more widely used. There has been a furious backlash from politicians, however. Shadow Home Secretary Diane Abbott criticised the force saying it could prove very dangerous.